The small FPV, camera equipped, Tiny Whoop like HB68 drone is perfect for indoor flying whether in your living room or in your office. The ducted propeller design offers good protection for the 4-leaf propellers. 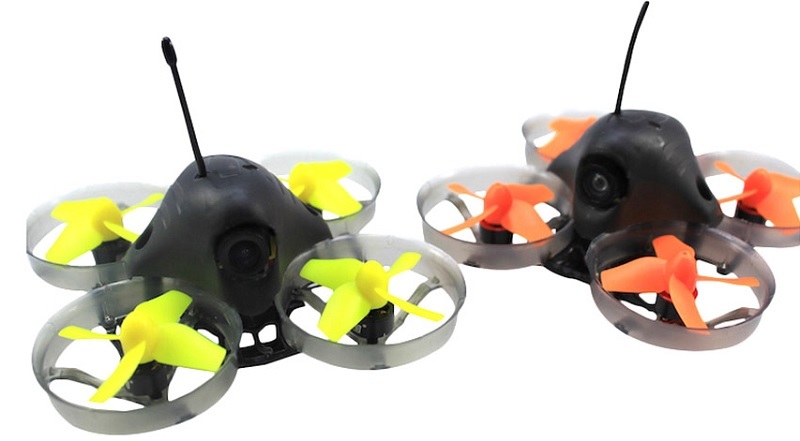 Thanks to the versatile F3 flight controller, this mini FPV drone can be configured with multiple flight modes. While Self leveled mode is suitable for newbies, Rate mode is recommended only to experienced pilots. Unlike many Tiny Whoop alternatives, the HB68 is equipped with brush-less motors instead of brushed ones. They are not just more powerful and accurate but also more reliable. We can found a classic 600 TVL camera with integrated 5.8G, 48CH, 25mW wireless-video transmitter on top of the aircraft. All the electronic parts, including the FPV rig are well protected by a nylon canopy. Unfortunately, we can not expect good flight from this little bird. The battery is a 1 cell, 260 mAh Li-Po, which should give you around 3 minutes of airtime. For this reason, it’s definitely worth buying a couple of spare batteries to keep you entertained for longer period of time.